Little Martial Arts is the best way for young kids to enter martial arts. With Little Martial Arts schools now operating in Narre Warren and Cranbourne, parents with toddlers/children who are interested in martial arts based skills programs can access these specialised martial arts programs on Saturday mornings in Narre Warren and Cranbourne and on Tuesday mornings in Narre Warren. 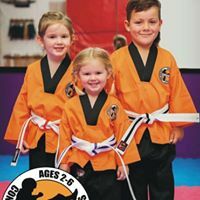 Our totally unique programs give a great grounding in excellent martial arts fundamentals such as kicking, punching, footwork, self defence, as well as developing motor skills, gaining confidence, learning about structure, and most importantly. The Kids Love IT! This is FUN. Parents are on the floor with their kids guiding them through an exciting program of obstacles, martial arts skills and games. Still loads FUN, lots of skill based games but much more emphasis on gaining quality martial arts skills. This is the one for the adventurous. A higher skill set to suit the average 6 year olds and the more “mature” confident 5 year olds.